Last week, we published an article showing why the cost of solar is probably 2–100 times cheaper than you think. With so many people thinking that solar energy costs much more than it actually does, one would think that no one is going solar, right? Well, with the advantages of solar energy starting to get out there more, and with the cost of going solar beating the heck out of the price of electricity in an increasing number of places, solar energy is growing fast in the US. For sure, this is just the beginning, but have a look at these solar energy growth charts below for a quick look at recent trends, followed by more on the advantages of solar energy. 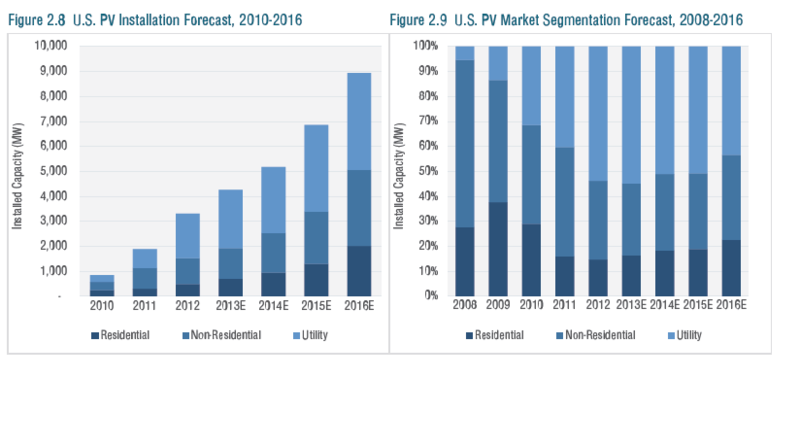 Residential solar energy growth has indeed increased several times over in recent years. Commercial solar energy growth (which is largely what the “Non-Residential” segment represents) has also grown in leaps and bounds. Companies like Walmart, IKEA, Google, Apple, Walgreens, Kohl’s, and many others have discovered that going solar is cheaper than relying on utilities for 100% of their electricity. Of course, the image benefits also don’t hurt, but it’s really the financial benefits that have driven these companies to start going solar to such a large degree. 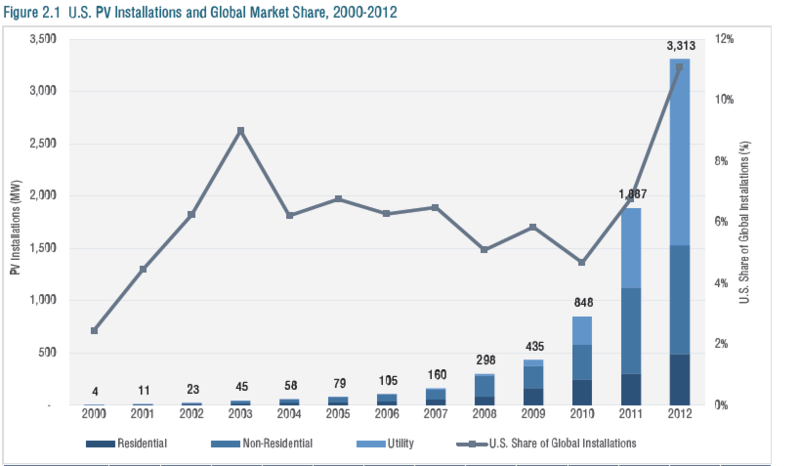 Utility solar energy growth is also strong. 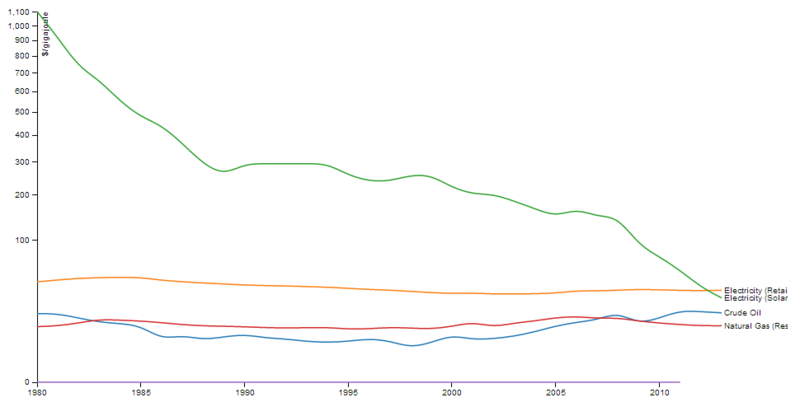 The bottom line is: solar energy is getting competitive (i.e. cheaper than alternatives) in a growing number of places. As such, at every scale of electricity production, solar energy is growing strong. Actually, nothing’s wrong at all. Due to various tax and policy factors, Q4 is always the strongest quarter of the year and Q1 is always the weakest. Take a look at the chart carefully to see that pattern. Even despite this, Q1 2013 was the 4th best quarter for US solar energy installations ever. That’s impressive. Also, clearly, Q4 2012 was the best quarter ever in overall solar energy growth. One more thing to note is that residential solar energy installations actually increased from Q4 2012 to Q1 2013! 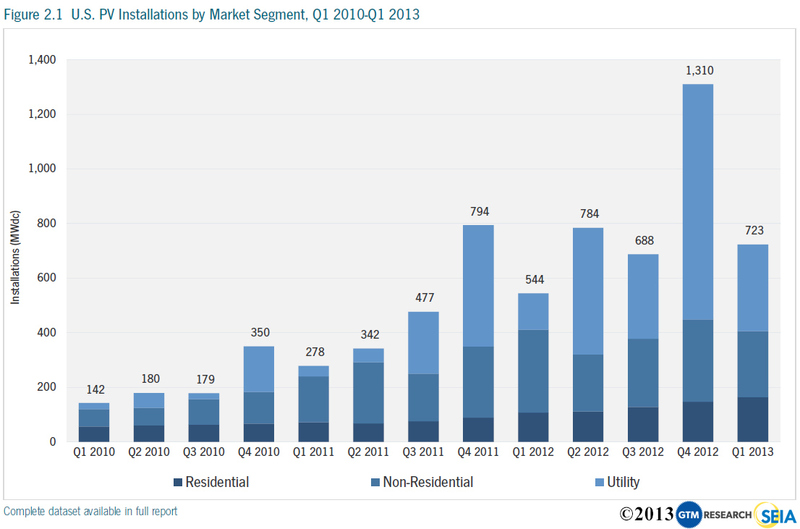 So, Q1 2013 was the best quarter ever for residential solar energy growth. The growth should get stronger as the year goes on, and solar energy is actually projected to be the #2 source of new US power capacity in 2013. Yep, that means more solar energy capacity would be added than coal power capacity, nuclear power capacity, wind power capacity, hydro power capacity, or anything else… except for natural gas power capacity, which is projected to be #1. Clearly, there’s a reason why solar energy is growing so fast, or several reasons. The bottom line is that the advantages of solar energy increasingly outweigh the advantages of competing electricity technologies. Let’s run down some of those. Notice the “Electricity (Retail)” and “Electricity (Solar)” crossover. But even in the case of solar energy being produced for sale to the utility (for sale as wholesale electricity rather than for use as retail electricity), it benefits from one key financial advantage — the electricity is created at the time of peak power demand, which makes it worth much, much more. I’ll explain this a bit more in one of the other sections below. Energy independence is another key advantage. For one, it’s simply good to cut your dependency on big corporations and semi-monopolies. I think that’s fairly well known. And who doesn’t like the feeling and freedom of being more independent? But there’s another specific advantage here worth paying a little attention to — and it also relates to those financial savings mentioned above. The price of electricity is projected to rise considerably in the coming decades. We have many old power plants that need to retire, and new power plants and infrastructure cost a lot more than old ones. Going solar fixes your prices of electricity for decades to come, so you become immune to those electricity price increases (well, at least when it comes to your home’s electricity supply — you will still be affected a bit as the price of goods goes up). There’s no denying the massive environmental benefits from going solar. By going solar, you will cut one of your three main contributors to global warming pollution. You will also cut your contribution to air and water pollution. And you will help to conserve water. Solar photovoltaic (PV) panels use over 20 times less water per kWh of electricity than nuclear power plants and over 16 times less water than coal power plants. That’s extremely important as large regions of the US (e.g. California, Colorado, Texas, and the entire Southwest) face increasingly severe water shortage threats. Our electricity system is complicated. You’re probably not very familiar with its intricacies. Let me catch you up on one of those. Much of our electricity today is produced from baseload power plans (coal and nuclear power plants) that take a long time to start up or shut down. These power plants run pretty continuously, providing the “base” of our electricity needs. However, our electricity needs vary a lot throughout the day. Demand starts to rise in the morning when people wake up, and in many places it peaks in the middle of the day (especially hot days where electricity-sucking air conditioners are heavily used) and in the early evening. Those baseload power plants can’t increase their production beyond a certain point. At that point, “peak-load” power plants must be turned on to produce electricity. The cost of electricity from these power plants is much higher, partly because of how the wholesale electricity bidding system is organized. I won’t bore you with all of that today. But one key point here is that solar energy systems don’t have any fuel costs (sunshine is free), so they can underbid any other source of power (well, except perhaps some other renewables like wind power, which also have no fuel costs). The result is that solar energy offers utilities cheaper “peak-demand electricity.” Notably, if the savings are passed on to consumers, this also helps to drive down the cost of retail electricity. Aside from all of the practical advantages of solar energy noted above, let’s not forget that we’re humans… and we care about what’s cool. Helping to save the environment is cool and new technology is cool, so solar energy is very cool. Going solar increases our coolness factor. It also improves the perception our kids have of us. Of course, in the case of businesses, the coolness factor is especially valuable. It makes your business look like a better company, a more responsible company, a more caring company… which it is (unless you’re just going solar for the financial benefits and to look cool). I think those are the main advantages of solar energy. But if you’ve got some more in mind, drop them in the comments below!